NEVER MISS A RECIPE, SUBSCRIBE TO THE NEWSLETTER! Craving a Margarita AND a sweet treat? 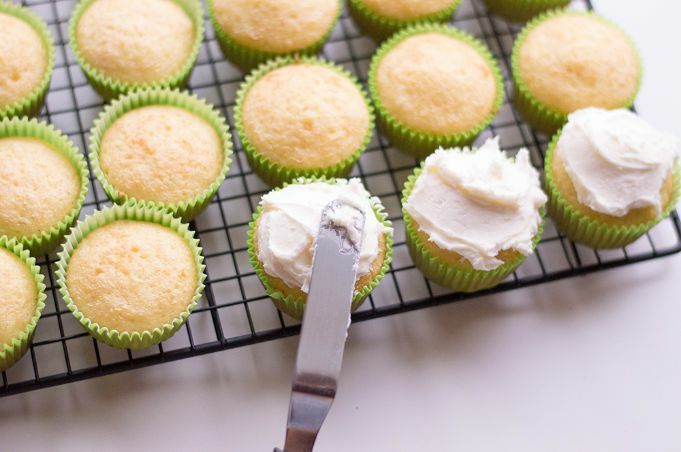 Get the best of both worlds with these fragrant and delicious Margarita Cupcakes! 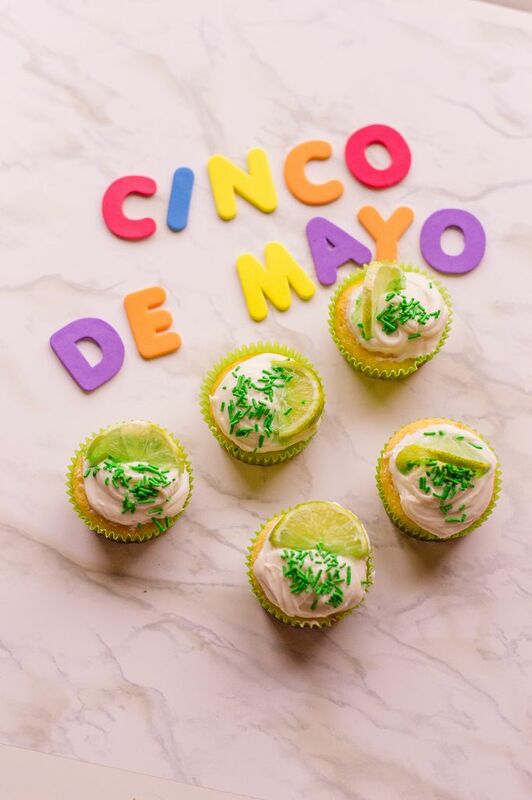 They’re perfect Cinco de Mayo cupcakes, or bake them whenever you’re craving a light, fruity cupcake. Y’all, margarita plus cupcake equals one happy mama! It’s like two of my favorite things got together and had a baby so I wouldn’t have to choose between them! 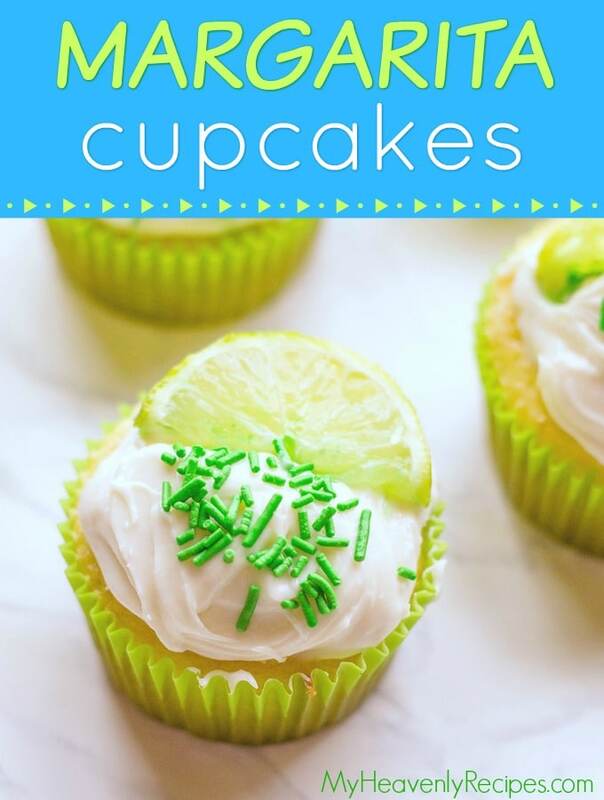 With these Margarita Cupcakes, I can have two treats in one, and you can too – soon! Cinco de Mayo is right around the corner and a perfectly good excuse to give these cupcakes a try. 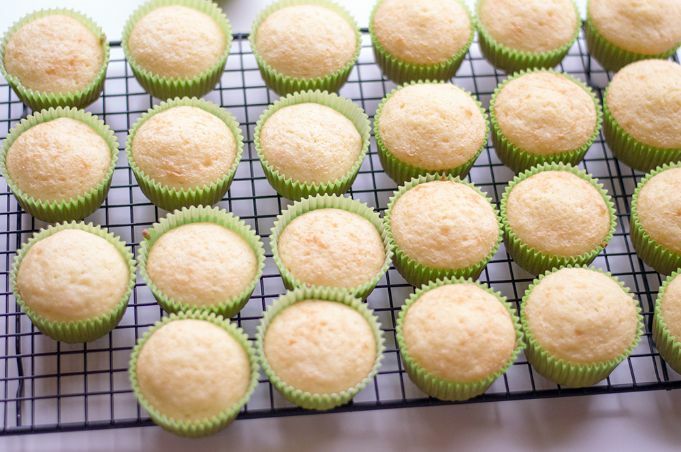 Plus, you know I like to keep it simple y’all, so for these Margarita Cupcakes we start with a boxed white cake mix and add just a little this and a little that to make them into something totally fresh and irresistible without the hassle or expense (two things I always want to resist). Tequila Tip: While you can use any type or brand of tequila for these Margarita Cupcakes, I prefer using a clear tequila. White, blanco, silver, platinum … these will all give you a lighter, tequila-kissed flavor. 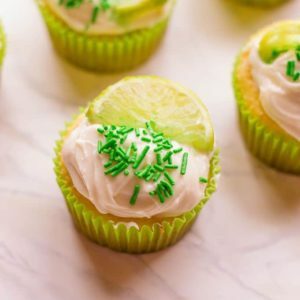 Whether or not you choose to add tequila to these Margarita Cupcakes, they are sure to be a total crowd-pleaser. They are light with a hint of fresh lime and are perfectly easy to whip right up (and gobble right down)! Do we really need a final reason? Every day can be a fiesta with these cupcakes! 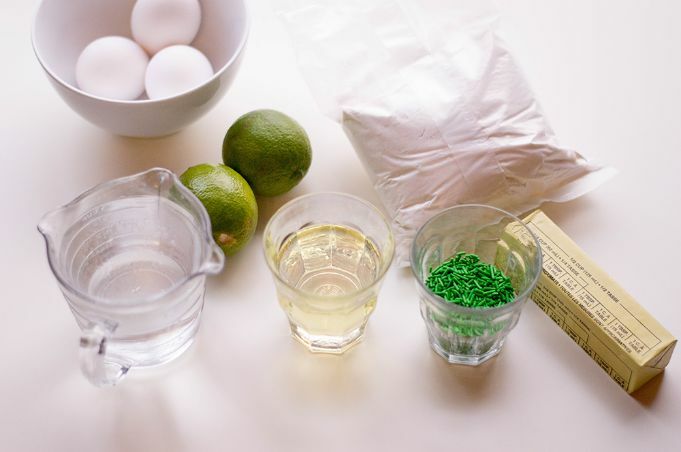 Ready to make Margarita Cupcakes? Let’s get started (so we can start eating)! Step #1: Line your muffin pan with cupcake liners and preheat oven to 350 degrees F.
Step #2: Start by preparing your cake mix according to the box’s directions. Grate one of your limes and fold the rinds into your batter. Step #3: Scoop your cupcake batter into each section of your muffin pan, filling it about 2/3 of the way. Bake for 13 to 15 minutes or until fully baked (if you poke a toothpick in the middle and it comes out clean, they’re done). Step #4: Allow to cool on a rack and start your buttercream frosting: using a stand mixer, on medium speed, beat butter and sugar and slowly add milk. Add more sugar and/or milk to achieve your desired buttercream consistency (TIP: we like ours a little bit stiff for decorating purposes). 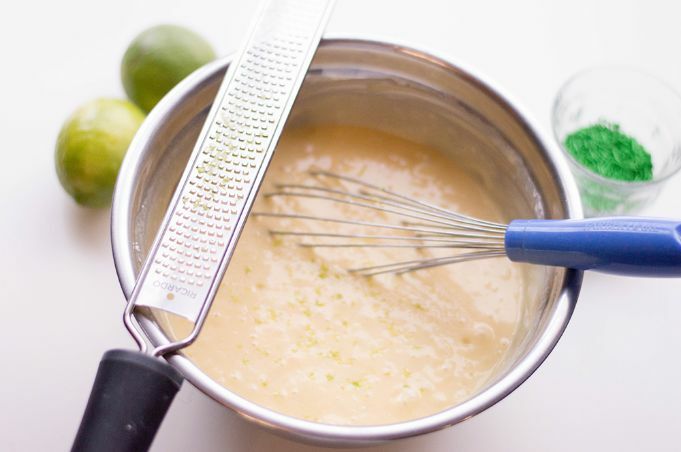 Squeeze in the juice of one lime into your frosting and fold. OPTIONAL Step #5: Once your cupcakes have cooled, brush a splash of tequila on the top of each one. Step #6: Using a piping bag, pipe large dollops of buttercream frosting onto each cupcake. Top off with green sprinkles. 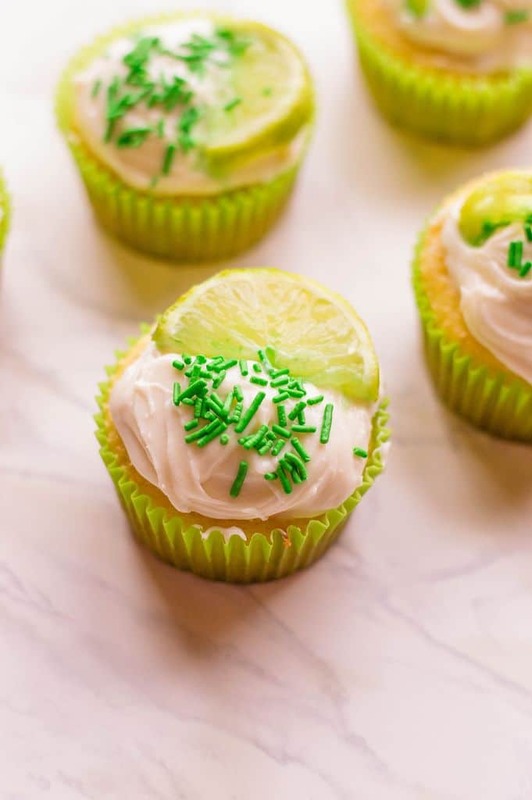 Step #7: Slice your limes and use it as a cupcake topper. Yum! 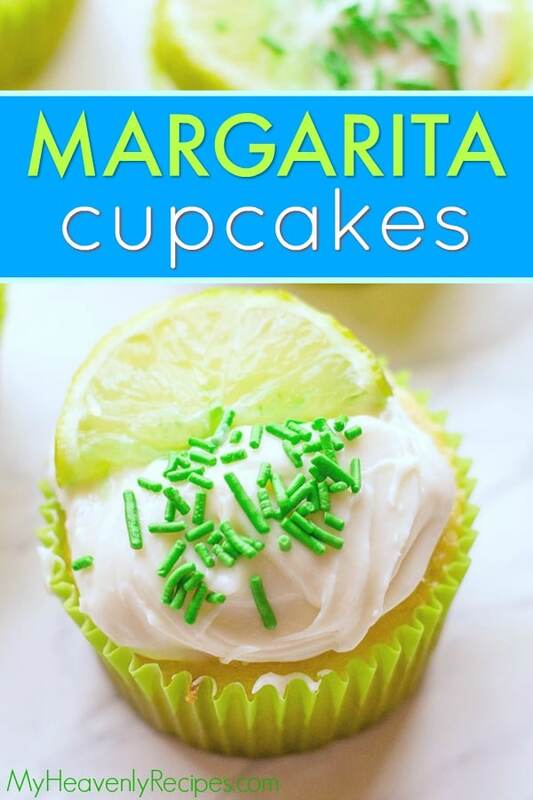 Like Margarita Cupcakes? Try These Other Cupcake Recipes! Enjoy, and happy Cinco de Mayo! 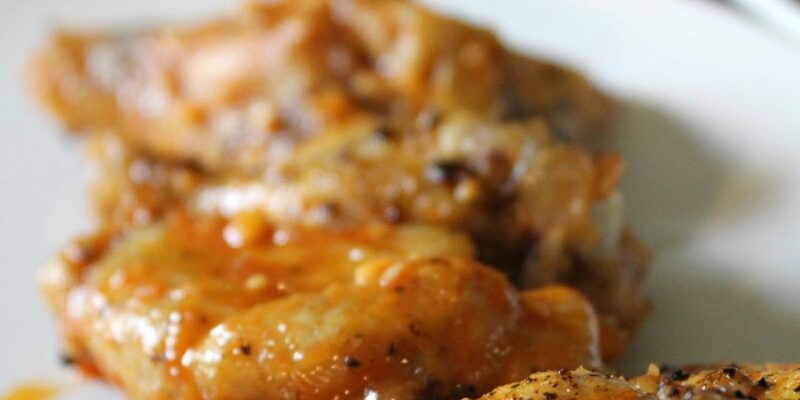 Follow along on Facebook, Twitter, Pinterest and Instagram for more Heavenly Recipes. These fruity and flavorful cupcakes are just what you need when you're craving dessert AND a Margarita! Line your muffin pan with cupcake liners and preheat oven to 350 degrees F.
Start by preparing your cake mix according to the box’s directions. Grate one of your limes and fold the rinds into your batter. Scoop your cupcake batter into each section of your muffin pan, filling it about 2/3 of the way. Bake for 13 to 15 minutes or until fully baked (if you poke a toothpick in the middle and it comes out clean, they’re done). Allow to cool on a rack and start your buttercream frosting: using a stand mixer, on medium speed, beat butter and sugar and slowly add milk. Add more sugar and/or milk to achieve your desired buttercream consistency (we like ours a little bit stiff for decorating purposes). Squeeze in the juice of one lime into your frosting and fold. 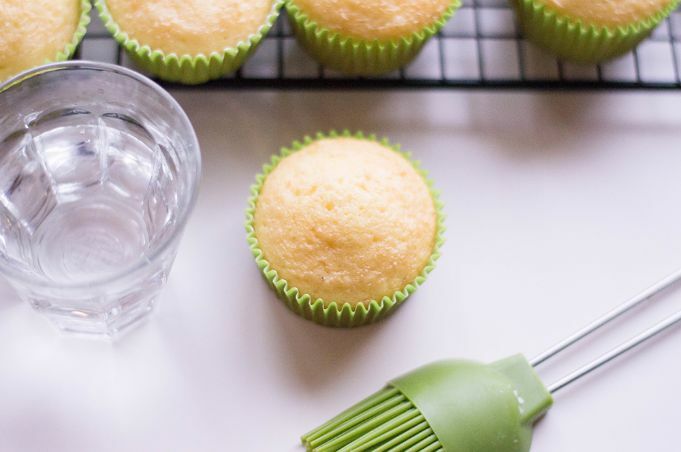 Once your cupcakes have cooled, brush a splash of tequila on the top of each one (optional). Using a piping bag, pipe large dollops of buttercream frosting onto each cupcake. Top off with green sprinkles. 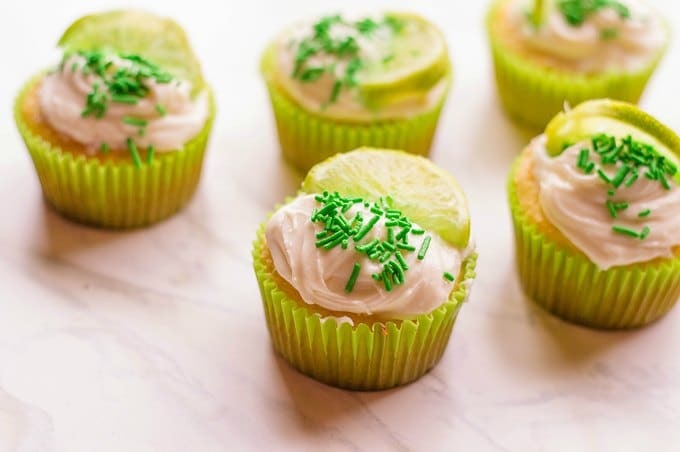 Slice your limes and use it as a cupcake topper. 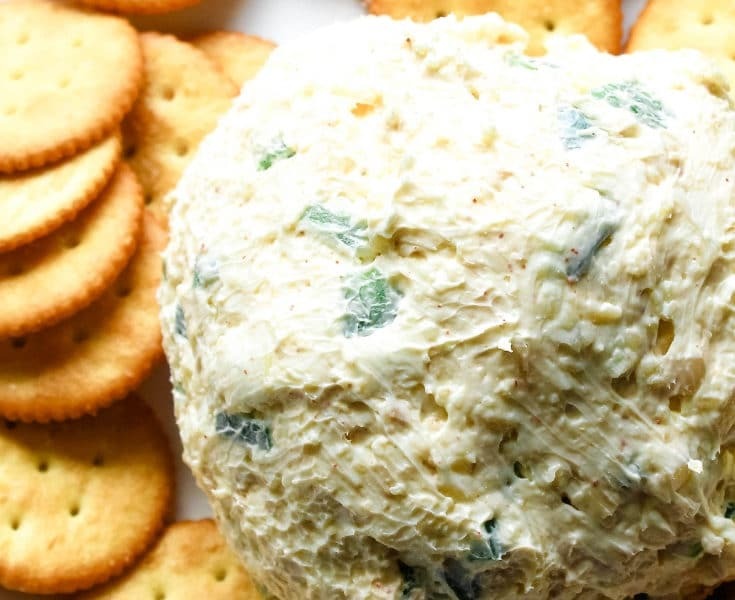 Tried this recipe?Mention @heavenlyrecipes or tag #heavenlyrecipes! 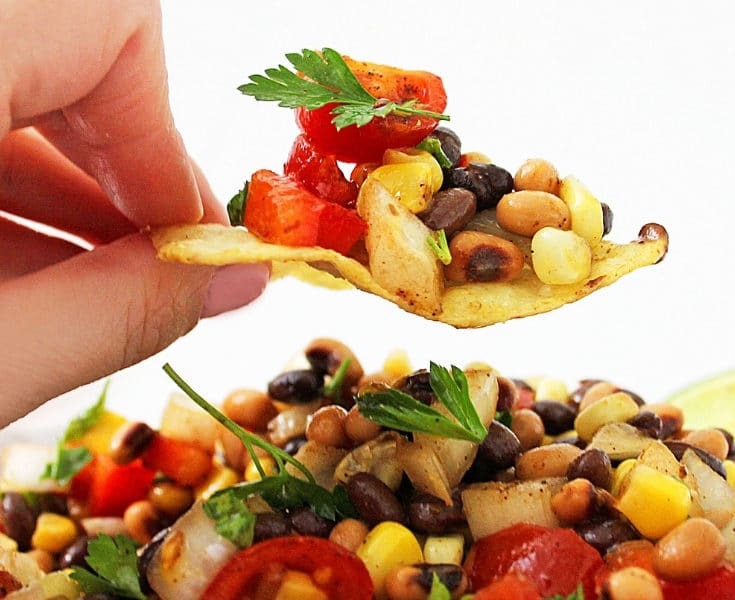 JOIN OVER 5,500 FRIENDS BY RECEIVING OUR LATEST RECIPES! JOIN OVER 250,000 FRIENDS BY RECEIVING OUR LATEST RECIPES! 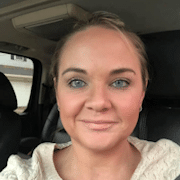 A lover of coffee, tequila and family! A wife to a hard working man and momma to 3 foodie kiddos. 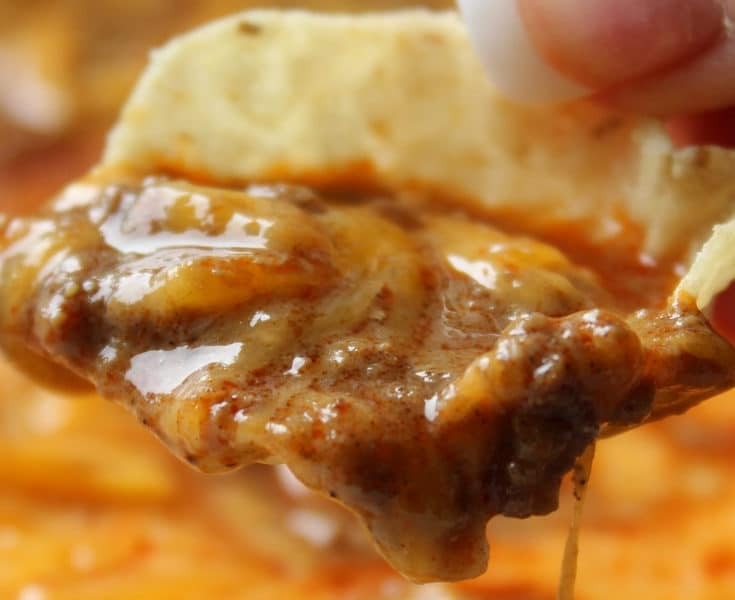 Welcome to our comfort food recipe website! 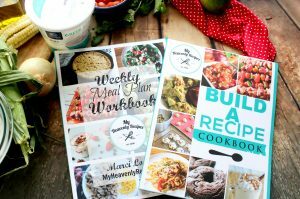 Where all our recipes include step by step photos and videos. You'll find comfort in that our recipes are made with fresh ingredients, imple to prepare and on the table in under 30 minutes! Join Over 10,000 Friends By Receiving Our Latest Recipes! Copyright ©2019, My Heavenly Recipes. All Rights Reserved.